The Rocket Assisted Descent (RAD) motors are essential for a safe landing on Mars. The parachute only reduces the speed of the lander from about 400 m/s (1000 mph) down to about 85 m/s (nearly 200 mph). Thus, without the RAD rocket motors, the Mars Exploration Rover would hit the ground roughly as fast as an Indy 500 racecar. While the airbags are quite strong, there is no way that they could protect something with the mass of a small automobile moving at that speed. 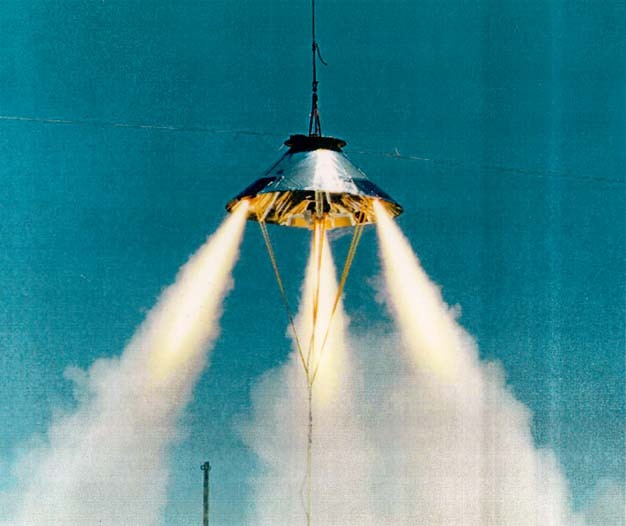 The brief firing of the solid rocket motors at an altitude of 80-100 meters (262-328 ft) essentially brings the downward movement of the lander to a halt some 10-15 meters or 33-40 feet above the surface. Engineers working on the RAD rockets benefitted from Pathfinder RAD designs, but had to invent a special way to prevent the backshell from tilting given winds and wind shear that are possible during entry, descent, and landing. Learn more about these RAD innovations in the technology section. Where are the RAD Rockets and how do they work? The conical backshell (part of the aeroshell) above the lander contains the three RAD solid rocket motors. Each of the three RAD rockets are powerful enough to lift a small truck, providing about a ton of force for nearly 4 seconds. They are activated by the computer in the lander. Electrical wires that run up the bridle close circuits in the backshell ignite the three rockets at the same instant. While the main RAD rockets can not be turned off once started, the lander and rover cut loose from inside their airbag cocoon at "just the right time" while the rockets fire. This separation has an additional benefit of launching the backshell and parachute up and away from the airbag-enshrouded lander. A cable cutter (a small pyrotechnic guillotine) inside of one of the lander petals does the job of releasing the lander when the vertical velocity has dropped to near zero through the rocket firings and the lander is around 10-15 meters (33-40 feet) above the ground.